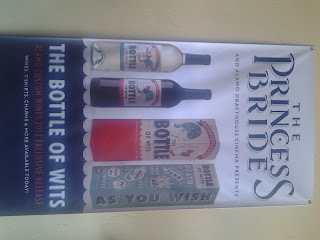 Yeah, you read that right: a Bottle of Wits! As if I didn't already love the Alamo Drafthouse more than is reasonably healthy, Tim League went and made a special deal to be able to offer these Bottles of Wits. Wits comes in As you Wish White and Inconceivable Cab. If you somehow aren't already a huge Princess Bride fan, this is a reference to the Battle of Wits that occurs after the protagonist inconceivably overcomes a few major obstacles. The Battle involved the drinking of wine thus making these Bottles of Wits an awesomely-appropriate tie-in. The Alamo Drafthouse is selling this specialty line in celebration of the movie's 25th anniversary. Bottled Wits start at $28 and range up to $100 for a two-bottle "fan pack" with a t-shirt and wine glass charms. Is $28 wine not your thing? You can also get just a t-shirt or just the charms...as you wish.